Ryan left himself instructions before bed, so as not to ruin the score of the Sharks game. When Ryan decided, all on his own, to become a San Jose Sharks fan, I tried to talk him out of it for a couple different reasons. One, he was moving on from my favorite team (the Washington Capitals) to a team that was basically its West Coast equivalent. The Sharks have authored a number of excellent regular seasons only to see them end prematurely in the playoffs, just as the Capitals have. In fact, the Sharks and Caps lost in the first round of the playoffs in consecutive years — after finishing the regular-season with the best record in the NHL. The other reason was the reality of him rooting for a team that plays the majority of its games in the Pacific time zone. Ryan hates to stay up late. A typical Sharks game starts at 10 or 10:30 p.m. our time. Good luck watching any of those. And so Ryan follows his favorite team mostly by checking stats in the morning. In the DVR age, we have tried and tried to convince him to record games and watch them when he gets up. By skipping commercials and intermissions, he could get an entire game in before school. There’s just one problem with this approach: Ryan insists on checking the scores — all the scores — as soon as he wakes up (and sometimes in the middle of the night, but that’s a story for another post). Once he knows the outcome, he loses interest in actually watching the game. As a result, Ryan follows his favorite team almost entirely by checking the scores and stats in the morning and maybe watching the highlights online. Only when the Sharks come East a few times a year, or have a rare afternoon start, does he get to watch them live. He agreed to watch them on DVR a few times, but usually admits that he already knows the score when the game starts. Saturday night, Veronica convinced him to try again. We set up the recording and promised to leave the TV on a non-sports channel when we shut it off (to prevent him from accidentally seeing the score on the ticker at the bottom of the screen). But this was not enough preparation for Ryan. He was not taking any chances. Knowing he would need to check the scores of all the other games, he carefully prepared a note to himself (pictured at the top of this post). 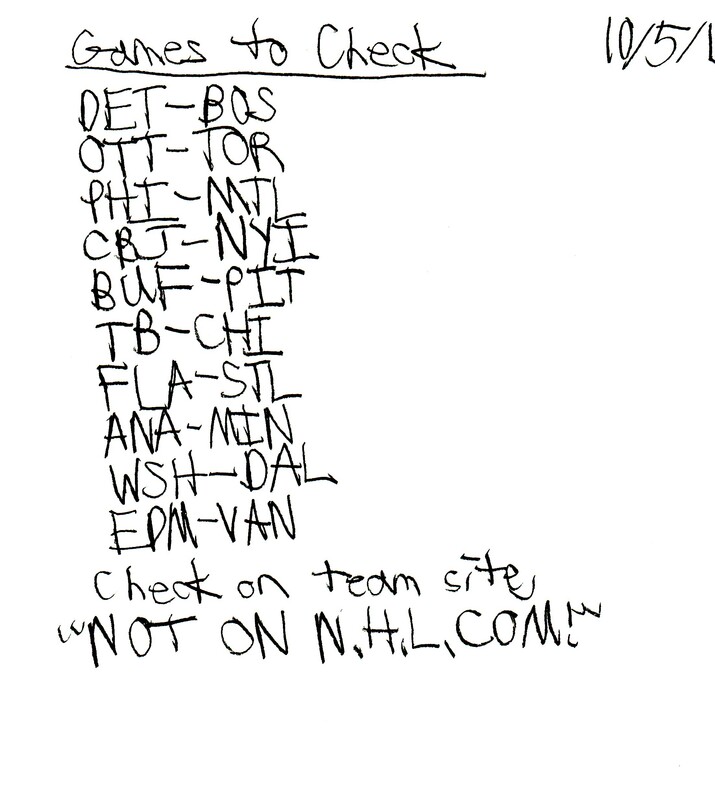 He wrote down all the other games, with a stern reminder to check their scores on each team’s Web site instead of the league site, NHL.com. The difference, of course, is that team sites only have the score of their game, while the league site has all the scores. I woke with Ryan in the middle of the night. Realizing he was checking scores, I popped my head in his room to make sure he hadn’t forgotten his note. I found him sitting on the bed, iPad in one hand and the note in the other, carefully going from team site to team site to make sure nobody had crossed one of his shots on goal thresholds. Of course, it’s far from ideal having him up in the middle of the night doing this, and we have struggled with how to handle it. Last season, we found that a quick check eased his anxiety and allowed him to go back to sleep. So far this fall, that hasn’t been the case, so last night we kept the iPad in our room. Regardless, when I got up Sunday morning, Ryan was on the couch, watching the Sharks on the DVR. I smiled for a moment before Veronica told me he lasted about a period before breaking down and checking the stats. Still, he watched the rest of the game (and the Sharks won) so he was happy. When it comes to Ryan’s idiosyncrasies, habits, anxieties and obsessions, there is no one playbook on how best to handle. It’s never as simple as denying him access to the thing that causes him worry and fear. Each is an exercise in managing anxiety. Sometimes, what worked last week or last month (or last season) no longer does, and so we huddle up and resolve to try something else. We have come to the realization — and acceptance — that these behaviors are a part of him. That’s not as easy as it perhaps sounds. We have learned to do what’s best for Ryan, while tying to set aside our feelings about a tricky behavior. We will continue to navigate this path, one issue at a time, measuring progress by the ability to successfully allay the things that cause him so much anxiety and fear. He watched one period of a game, long after it ended, without knowing the result. In our house, that counts as progress. I second the great comment above. Inch by inch, step by step…celebrating each success as it happens.